THIS one (below) is by-far my favorite photo of the bunch!! 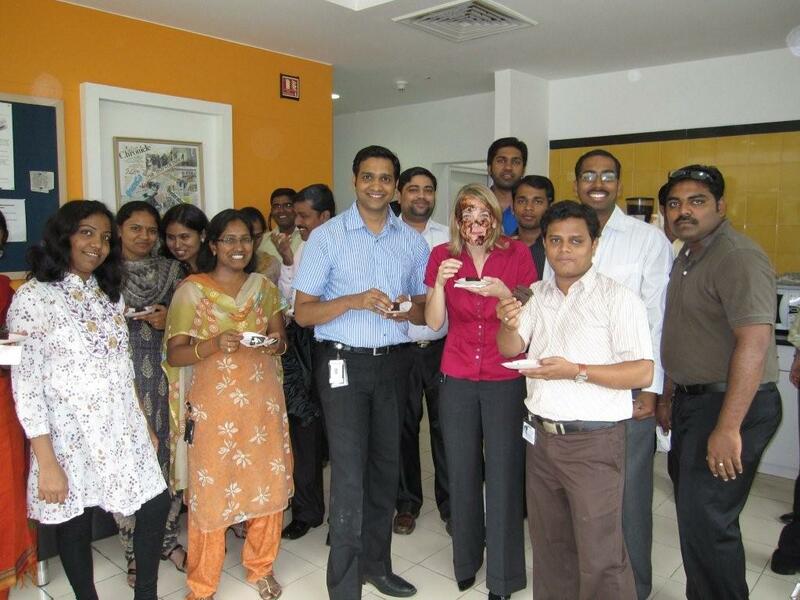 It seems to be a Deloitte Region 10 ("R-10" = "India") tradition, that, when an ex-pat rotates back to the U.S., they have a "cake cutting" ceremony. 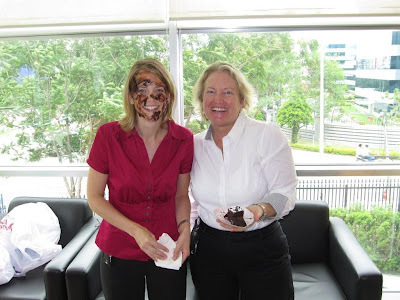 Suzanne sent me the photos just now of her compatriot and soon-to-be "ex-R-10er", Stephanie Liddy's "cake cutting" today. Stephanie and her husband Cory (who have been a lifeline for us for several months before we even got here!) are on the plane for the U.S. and eventually their new home in Downtown L.A. - TOMORROW!! Like Suzanne said, "The training-wheels are certainly coming off tomorrow!" So many thanks need to go out to Stephanie for helping to get ASB situated and "pointed in the right direction" with her new job here in Hyderabad. Honestly, if Stephanie had not taken the time to hold Suzanne's hand and show her the local ropes, things could be a lot different around here. I can't really tell from looking at the photos above how much actual cake "cutting" went on this afternoon...but it seems as if the individual cake is chosen, not-so-much by the quality or the taste...but on its "smear-ability"! 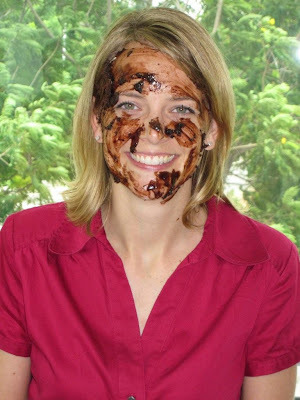 As you can see from these photos that they really "took the cake" to Stephanie - - and smeared it all over her face!! Thanks again, Stephanie. You are a real star and we owe you one! 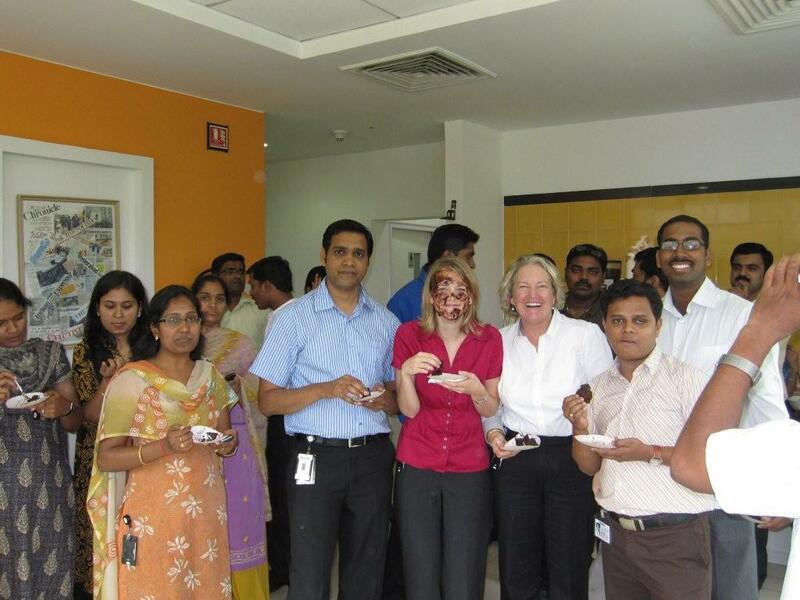 We'll see you back in Los Angeles in a couple of years after Suzanne gets her cake! !